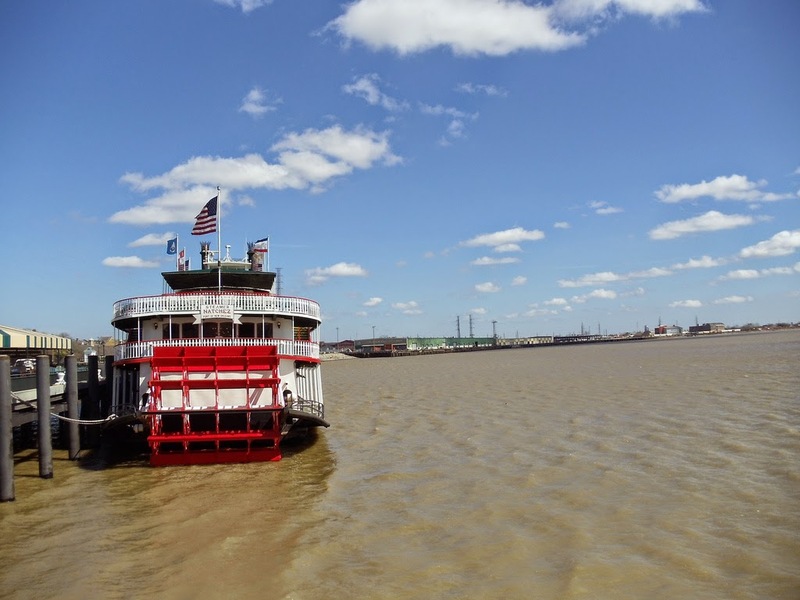 Muddy waters of the Mississippi River (Source). If your antibiotic looks like this, you're gonna have a bad time. Many antibiotics, being the products of microorganisms, can be manufactured by growing the appropriate bacterium or fungus in tanks filled with nutritious broth. Provided the proper incubation conditions are established, the microbe will happily eat up the broth, multiply to a tremendous degree, and synthesize and release the antibiotic into its liquid surroundings. From there, it's necessary to isolate the antibiotic from a soup of microbes, broth ingredients, and other microbial products. The first step is usually to filter the mixture to remove microbial cells and the external slime they encase themselves in. The resulting solution (filtrate) is then subjected to a sequence of procedures designed to remove all other compounds while still ensuring the recovery of lots of antibiotic at the end. These procedures often involve the use of ion exchange resins, activated carbon, and various solvents, acids, and bases. "Mrs Ethel Florey was busy on her bicycle each day, collecting the overnight urine from the various hospitals from patients taking parenteral penicillin. The more sophisticated among us called this "the morning milk round," the less so called it "the P patrol." This urine contained two thirds of what had been given to the patient, and of this one half could be retrieved - recycling, so to speak. One great advantage was that this penicillin retrieved from the urine had been freed from the "gubbins" of the culture medium, which was some 90% of the total that the patient had received at the time of the original injection. This purified penicillin was very popular as its injection was virtually painless and free from the short but awful reaction that the impure penicillin produced. At that time penicillin was a brown powder and in solution it looked rather like dilute mustard, and when injected it felt like it too." 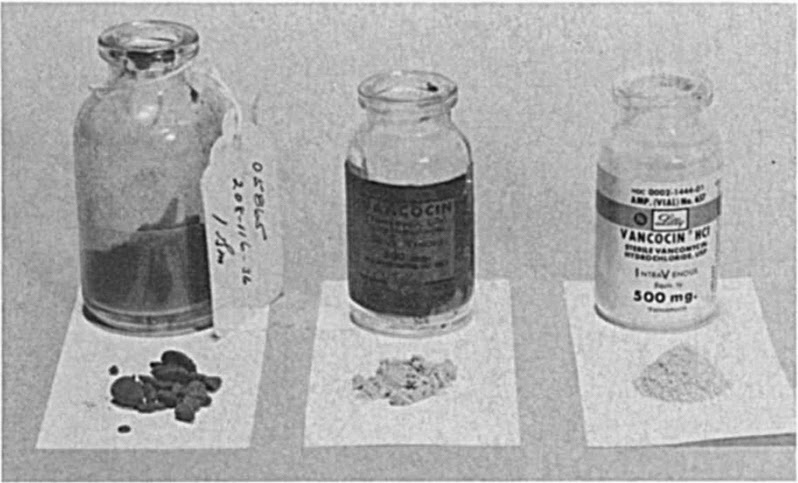 Looking beyond penicillin, early crude preparations of the antibiotics streptomycin and vancomycin were observed to cause allergic reactions involving such delightful symptoms as flushing, headache, nausea, and dizziness. Impurities present alongside vancomycin were also implicated in causing high fevers, vein inflammation, and kidney damage in patients taking early batches of the drug. Vancomycin was developed in the late 1950s in response to growing concern about the bacterium Staphylococcus aureus, strains of which were causing deadly infections in hospitalized patients due to their acquisition of resistance to available antibiotics. After soliciting soil samples from around the world (soil is a great place to look for antibiotic-producing bacteria), a sample from Borneo was found to contain a bacterium capable of making an antibiotic called compound 05865. This compound, later renamed vancomycin on account of its ability to vanquish bacteria, was found to kill various strains of Staphylococcus aureus and also wasn't too toxic to animals. After successfully testing it out in a couple dozen sick volunteers, word got out and demand for vancomycin skyrocketed. All available supplies were quickly shipped out to hospitals with patients whose infections were not responding to other antibiotics. This was not the time for fancy purification methods. Early batches of vancomycin were nicknamed 'Mississippi mud' due to their brown colour (vancomycin is white) and otherwise murky appearance. Even with the impurities, the antibiotic saved many lives, and improved purification methods were quickly put into place. Dunlop DM, Murdoch JM. 1960. The dangers of antibiotic treatment. British Medical Bulletin 16(1):67-72. Griffith RS. 1984. Vancomycin use - an historical review. Journal of Antimicrobial Chemotherapy 14 Suppl D:1-5. I have often wondered whether, in some sort of post-apocalyptic/stranded-on-a-desert-isle type scenario, one would be able to manufacture, in some crude way, say, penicillin? Obviously, you'd have to begin with some mycological skills, but I wonder if it could be managed well enough under primitive conditions to be useful? It's a cool question to ponder eh? For penicillin, I figure you would need (1) a source of Penicillium chrysogenum, (2) the means to grow a bunch of the fungus without contamination, and (3) a method for isolating the penicillin. (1) As far as I know, spores of Penicillium species are fairly common in the air floating around us. Also, P. chrysogenum has a characteristic blue-green colour and is known to grow on rotten fruit and open plates of nonspecific agar-based growth media. (2) I've heard that used coffee grounds make a good selective medium for Penicillium species, so perhaps mix them with water and then boil over a fire? A solution of sugar and baker's yeast, or just water mixed with ground up barley or corn might also work. (3) Isolation would probably involve filtering through cloth and then playing around with whatever solvents, acids, and bases you could get your hands on.